Why do we edit out the junk in life? 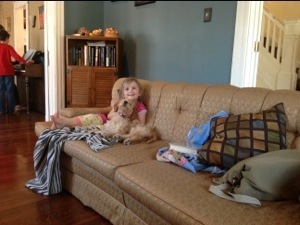 This question occurred to me as I was taking a picture of Lydia and the puppy on the couch. At first glance of my finished picture, I saw the blanket, the pillows, a shoulder bag, a book and people in the background. Instead of concentrating on her adorable smile and obvious effort to strong-arm Lexie, I was preoccupied by the stuff around them. My first instinct was to quickly hit my edit button and begin to crop down the picture to what I wanted to see – the idyllic picture of my sweet, energetic four-year-old and our puppy. Sometimes the stuff is part of the picture, especially in life. We spend a lot of time trying to show only the best part of our lives – our families, our jobs, our homes. We tell ourselves we are just putting our best foot forward; after all, who wants to be a kill-joy? I mean, nobody wants to hear or see the junk, right? But I really think the main motivator is pride. We become fixated on self-preservation and we don’t even realize it. We don’t want to look bad in anyone’s eyes because of course that will ultimately lead us to feeling bad about ourselves. What I find really interesting is during a difficult season in life when I open up my mouth and allow the snapshots in the picture of my life to show the whole story, not just carefully edited frames, people look, listen and care. As a matter of fact, in different seasons of my life when I have had struggles, one of the number one responses after I have illuminated the real scene has been, “Oh good, you’re not perfect!” It amazes me on two counts. One, that someone would even think I was perfect for a minute and two, how the reaction to my vulnerability shows everyone really does desire to see the imperfections. Of course, I am not perfect; nobody on this green planet of ours is perfect! But most of us run around thinking someone else is perfect. And why is it when we see a chink in someone else’s armor we breathe a sigh of relief? What if my couch didn’t look cluttered? Hey, maybe my bathtub needed a good scrubbing instead but I just didn’t take a picture for all to see. I think sometimes we have shown the bathtub to someone and their response has been less than kind; they judged us. They were so busy keeping their own photos and image edited, they didn’t stop and really appreciate the honesty of ours. But still we keep the shutter on because we all want to share and connect on some level. I think the bottom line is being happy for other people’s pictures we see. I mean, maybe the perfectly-posed family picture on the beach was taken weeks after a cancer diagnosis, a betrayal, a wayward child who had come home, a bout with depression. So let’s just remember to be happy for the precious moment as we glimpse into one another’s lives. The picture doesn’t always tell the whole story. But remember sometimes, when there is extra junk cluttering the picture and the focus is just a little off, it really is okay. No one is perfect and someone, somewhere out there can relate. And the true humanity of the story may just help us all along the way. This entry was posted in Life and tagged Picture, puppy, snapshot. Bookmark the permalink. What a great post. ……I can totally relate!